There are five wheels of energy which run along the central channel of the spine, culminating at five different energy centers in the subtle body. They show how the planets spinning in space are reflecting our own being, mapped out in our subtle body. There are also said to be 72,000 circuits of energy moving around our entire subtle body. Of these, there are three that are looked at initially when acknowledging planetary influence. These are the left, right and central channels along the spine. The left channel is the cooling, lunar side of the subtle body and the right represents the heating, solar side. The central channel represents the pathway where the universal soul finds a balance with the embodied soul, as represented by a balance between the Sun and the Moon; our true spirit and our sense of an individuated self. These three channels come together at six important points in our subtle field of energy along the spine and then ascend in unison to the crown of the head. They begin at the base of the spine and come together at the point between the eyebrows, commonly referred to as the 'third eye'. Both sides are regulated by the breath, which is seen to alternate between both right and left nostrils every 60 minutes or so, and can be seen to be balanced through both as it moves from one nostril to the other. It can also be seen to be more balanced at junctures of the day and night, representing the ongoing cyclic that nature reflects in our own nature. The left nostril corresponds to the right side of the brain and has an 'anabolic' effect. The right nostril corresponds to the left side of the brain and has a 'catabolic' effect. Activities can be undertaken accordingly. For example, it would be ideal to eat while the right-nostril breath is dominant, so as to properly digest the ingested food. Activities such as the time to retire to bed would ideally begin once the left-nostril breath has become dominant. Each of the five planets corresponds to the five elements and a point located along the central channel. In Pandit Sanjay Rath's book Vedic Remedies in Astrology, he gives a table for each of these centers and their ruling planets. The elements can be seen to become denser as we move down into the lower centers. Space is predominant in the head region, of which the mind is a subtle aspect and is represented by Jupiter. The element of air moves down into the throat and chest and is represented by Saturn at the throat and the Moon at the heart. The fire element brings us into the navel and is represented by Mars. Water takes us into the hip region and the planet Venus. Earth brings us to the base of the spine and the planet Mercury, which represents our more practical concerns, rooting us to the earth. The Sun, representing the Supreme Self, is beyond the experience of the manifest universe and, although the Sun does correspond to the fire element in a higher sense, it also represents the un-manifest spirit which is beyond the influence of the elemental forces. There is a seventh center located at the crown of the head which takes us beyond the elemental influences and into spiritual realms. The map of the planets I have given is but one way to view the planetary influence on the subtle body. There are many other approaches. In practical application, the planets can be seen to represent the area of the body which corresponds to the signification of that planet. 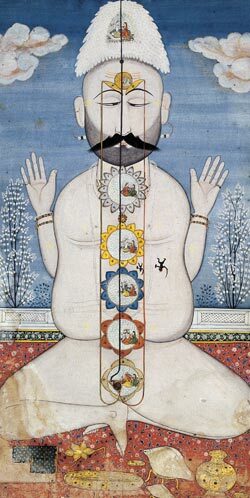 According to the Vedic astrologer Freedom Cole, 'the natural indications of the planets line up with the nature of the chakras (energy centers) more than the elements' (F. Cole, personal communication, October 17th, 2013). So, for example, if Mercury were studied in any given horoscope, though the concerns are practical and relate to the earth element and the base of the spine, the throat is also studied because Mercury represents speech. ​Sanjay Rath (2002) Vedic Remedies in Astrology, Second edn., New Delhi, India: Sagar Publications.